Just after half past eight GMT on the morning of February 27th, BBC Radio Lancashire’s Graham Liver show ran an item pertaining to a report released that same morning by Amnesty International under the title “Trigger-happy: Israel’s use of excessive force in the West Bank”. The programme can be heard here for a limited period of time, with the relevant segment commencing from 02:38:30. Below is a full transcript of the item. 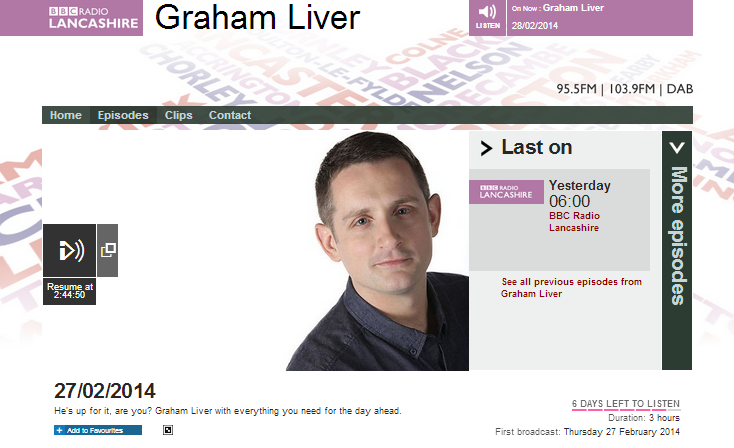 If readers are wondering why a local radio station would choose to run an item on a topic clearly outside its sphere of interest, the answer to that comes in presenter Graham Liver’s introduction. Beyond the fact that the time and opportunity to speak allocated to both interviewees is clearly unequal, it is obvious that this item’s timing – half past eight in the morning on the day of the Amnesty report’s publication – suggests that it was planned before Graham Liver and his production team (who had been on air since 06:00) had actually read the report and therefore the question of who initiated the BBC interview with Gordon Bennett arises. Notably, Liver refrains from asking Bennett directly whether or not he contributed to Amnesty’s report – which does not state the names of its authors or researchers – and does not raise the issue of Bennett’s credentials to conduct analysis relating to military affairs. As has been noted in the past by NGO Monitor – and admitted by Amnesty itself – its ‘researchers’ are not qualified in that field and are actually no more than political activists. Clearly way out of his depth on this topic, Liver also fails to raise the subject of the political motives behind a report produced by an organisation with a long record of anti-Israel campaigning and a whole host of dubious connections. The International Solidarity Movement is of course anything but a “non-violent” organisation and it has proven connections to the terrorist organisation Hamas. This “peace activist” (a title which, after all, does not require any sort of qualification in this day and age) does not shy away from publicity. In an interview he gave to the Lancashire Evening Post on February 13th 2013, Bennett claimed to have been refused entry to Israel, which would hardly be surprising given his ISM links. “On Sunday, February 3, he tried to re-enter Palestine via the Allenby Bridge crossing from Jordan, but was turned away by security officials and has his British Passport endorsed so he cannot go back to Israel or Palestine. He said: “After lengthy questioning by Israeli Immigration, who control the border, I was refused entry. “I was then sent immediately back to Jordan. The Jordanian officials had clearly seen this happen many times before. “Having been refused entry at the border, Gordon said he planned to return to the UK to take part in protest actions against the Israeli occupation. So in fact, what we have here is a professional anti-Israel activist with links to an organisation connected to a terrorist group proscribed by the British government being given a platform on a local BBC radio station from which to publicise and promote a political campaign thinly disguised as a “report” on a subject about which its ‘researchers’ are in no way qualified to write. That, of course, is not journalism: it is quite simply the enabling of the latest propaganda promoted by political campaigners who have self-conscripted the halo of ‘human rights’. But the BBC’s helpful push to Amnesty International’s cart of defamation did not end with red rose county local radio: more on that in part two of this post. 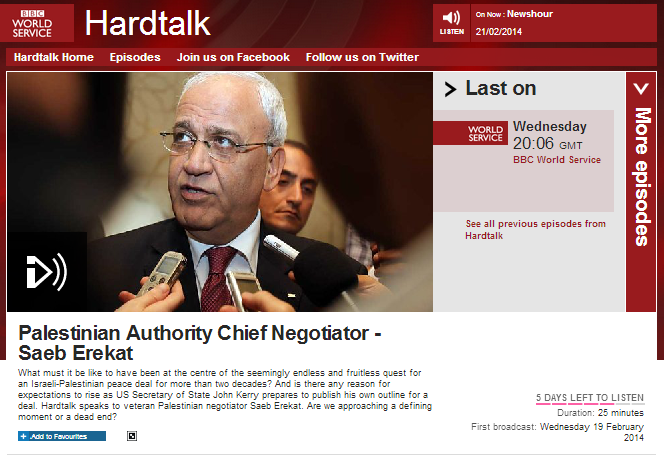 In part one of this post we looked at the first part of an interview with Saeb Erekat on the BBC programme ‘Hardtalk’ which was broadcast on February 18th. The remainder of the interview begins with presenter Stephen Sackur challenging Erekat on the subject of the ‘right of return’. “Now let me put the record straight on what Abu Mazen [Mahmoud Abbas] said about refugees. No refugee mandated me to negotiate on his behalf. In international law, the British Palestinian who lives in Britain and has British citizenship, he will make his choice. Abu Mazen said that’s the choice of every single refugee. They have…we have to establish an international mechanism and in that international mechanism, US, Europe, Arabs, UN, host countries, Israel, Palestine will go to refugees and give them the choices of whether they have the right to come to Palestine with the compensation – Israel will compensation – remaining where they are. And that’s how you end conflict and that’s how you end the claims. But if the Israelis want for me to come and through Hardtalk and say I give this up, I give this in, I give this up – what is there left to negotiation? Avoiding informing audiences of the Arab League policies which have deliberately kept the descendants of refugees in that status for generations or any mention of Jewish refugees from Arab lands, Sackur also fails to clarify the very important point being made by Erekat: that the PLO negotiators do not actually consider themselves to have a mandate to negotiate on the vital subject of refugees. Instead, he moves on to question Erekat on the subject of land swaps whilst himself also promoting the erroneous notion of a “’67 border”. In other words, Sackur gives BBC ‘authority’ to Erekat’s claim that 10,500 housing units have been “added” – which most listeners or viewers will take to mean built – in the past four months. He makes no attempt to clarify to audiences that Erekat’s numbers actually relate to building tenders and announcements – as can be seen in a document produced by the PLO’s Negotiations Affairs Department which Erekat heads. In fact, the statistics for the whole of 2013 – not just from the end of July when the talks resumed – show a total of 44,343 building starts in the whole of Israel, with 2,534 of those being in Judea & Samaria and 4,625 in the entire city of Jerusalem. The statistics for completed construction in 2013 show 41,972 completes in the entire country of which 1,365 were located in Judea & Samaria and 3,652 in the city of Jerusalem as a whole. Clearly both Sackur and Erekat are quoting inaccurate statistics and hence deliberately misleading BBC audiences on this subject. Next Sackur challenges Erekat on the practicalities of the demand for eastern Jerusalem as the capital of a Palestinian state. “I’ve been visiting your part of the world for the best part of a quarter of a century – almost as long as you’ve been a negotiator. I have seen the facts on the ground change over the years. East Jerusalem for example is now – the Arab East Jerusalem that we talk about – is encircled by a vast chain of Jewish housing from – what is it? – Pisgat Ze’ev in the north, right round through Ma’ale Adumim to Gilo and Har Homa in the south. I mean that is the reality and when you talk about East Jerusalem being the future capital of Palestine, you know as well as I do that East Jerusalem is now fundamentally disconnected from the West Bank. Isn’t it time for you to deal with realities rather than dreams? With no questioning of Erekat’s bizarre ‘conversion’ statements and no challenge to Erekat’s chimera of ‘settlements’ – including Neve Ya’akov which was established in 1924 on Jewish-owned land – as the main obstacle to an agreement, Sackur goes on to ask his interviewee to name “one significant, fundamental concession” made by the Palestinian negotiating team. Sackur makes absolutely no attempt to challenge Erekat on his blatantly false representation of the situation regarding freedom of worship in Jerusalem at present and neither does he raise the issue of lack of satisfactory access – in breach of the Oslo Accords – to Jewish holy sites already under PA control. Instead, he continues by asking Erekat to confirm the PA’s agreement to the placing of some sort of international force in the Jordan Valley, which Erekat does but with the caveat that “this force will not be a combating force”. Ignoring the issue of the existing precedents of multiple failures of international ‘peacekeeping’ forces to actually keep the peace in the region, Sackur goes on to challenge the practicalities of that idea, rightly pointing out that there is no chance of it being accepted by Hamas and other rejectionist Palestinian factions. The next subject brought up by Sackur is that of what will happen if the current talks fail. With regard to the feasibility of the PA “going perhaps to the International Criminal Court”, it is worth reading Professor Eugene Kontorovich’s paper from 2013 on the subject. Erekat’s response consists largely of yet another attempt to persuade viewers that the success – or lack of it – of the current talks depends entirely upon the prime minister of Israel. To finish the interview, Sackur asks Erekat for his personal reflections on two decades of negotiations, but notably avoids bringing up the subject of the PA’s decision to scupper the peace process by instigating the second Intifada. That avoidance of any mention of the Oslo Accords permits Erekat to mislead BBC audiences further by erasing the fact that his “home town” was occupied by Jordan even before Erekat was born and by omitting any mention of the fact that Jericho has already been under the control of the Palestinian Authority for twenty years – since 1994. In conclusion, this interview is something of a mixed bag. On the one hand, Sackur did go some way towards seeking to clarify Erekat’s position on internal Palestinian opposition to an international peacekeeping force in the Jordan Rift Valley, on the subject of the recognition of Israel as the Jewish state, on the ‘right of return’ for Palestinian refugees, on land swaps and on eastern Jerusalem. On the other hand, Sackur allowed BBC audiences to go away with damaging inaccurate impressions regarding, among other things, freedom of worship in Jerusalem, 1967 “borders”, the “occupation” of Jericho and Israeli building. He made no attempt whatsoever to challenge Erekat’s conspiracy theory concerning US foreign policy or his ridiculous “son of the Canaanites” narrative and he failed to question Erekat’s promotion of Israeli housing as the main obstacle to peace and his repeated claim that the success or failure of the talks is entirely dependent upon the will of Israel’s prime minister, whilst simultaneously excluding all mention of issues such as the rise in Palestinian terrorism since the beginning of the talks or incitement and the glorification of terrorism on the part of the PA. In short, much of the opportunity provided by this interview to inform BBC audiences of the real difficulties facing negotiators in the current talks was wasted on providing a platform for the promotion of Saeb Erekat’s blatant propaganda and historically inept “narrative”. The UK taxpayer continues to contribute not insignificant sums of money to keep Erekat’s PLO Negotiations Affairs Department (NAD) afloat – and has done for the last two decades. One of several “risk descriptions” cited in a risk assessment compiled by DfID ahead of a particular funding initiative which is still ongoing is “NAD outputs contain inaccurate information, vilification or incitement” and that risk is supposed to be monitored by the UK government. Those same UK taxpayers – many if not most of whom are also BBC licence fee payers – might hence have expected a more robust performance from their national broadcaster (which is still, in part, government-funded) in challenging Erekat’s promotion of inaccurate information and incitement in the form of warped historical “narratives”. 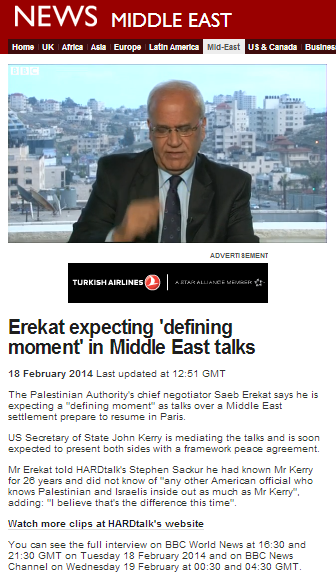 Had that been the case however, a link to Erekat’s ‘Hardtalk’ interview might perhaps not be currently featured on the NAD website. 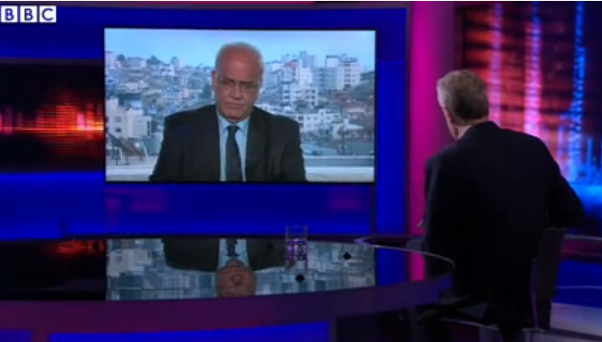 The February 18th edition of the BBC’s ‘Hardtalk’ featured presenter Stephen Sackur once again interviewing the programme’s frequent flyer Saeb Erekat. The programme is available in the UK on BBC iPlayer and an audio version was also available from the BBC World Service for a limited period of time, along with a BBC World Service podcast. In addition, the first part of the interview was uploaded by the BBC to YouTube and featured on the BBC News website, as well as on the Hardtalk webpage. Notably, Sackur made no attempt to challenge Erekat’s opening thinly veiled conspiracy theory-style accusation of Israeli influence over American foreign policy. But Sackur’s failure to challenge Erekat’s serial falsehoods becomes even more apparent in the rest of the interview; the parts not as enthusiastically distributed and promoted by the BBC. Sackur asks Erekat if the PLO will be prepared to continue talks after the end of April. Sackur does robustly challenge those statements. Erekat’s notably personalised response is delivered in near-hysterical tones. “What else? Now you want Israel as Jewish state? You want me to give up on East Jerusalem as my capital as Netanyahu says? He wants me to give up on my independence and sovereignty because he wants to stay instead of Palestine and his army for years to come. Well if that’s what he has in mind, he can make peace with himself and dictate on the – this will not happen. My narrative here is that, as you said, I’ve been trying to make peace and save lives of Israelis and Palestinians and change the status quo towards the two-state solution, towards [unintelligible] between Palestinians and Israelis for the last 20 years. And those who failed me are those who continued with the settlement activities and dictations and the fait accompli policies. That’s number one. At that point Erekat is interrupted by Sackur, but the latter makes no attempt whatsoever to relieve BBC audiences of the inaccurate impressions created by Erekat’s “narrative”. Of course this is not the first time that the PLO’s chief negotiator has fabricated history: he promoted the same myth at the Munich security conference just a couple of weeks before this Hardtalk interview. According to a BBC profile of Erekat, he was born in Jerusalem (specifically the Abu Dis neighbourhood) but Sackur does not challenge his self-made redefinition as a “son of Jericho” or question him as to the fluidity of his “narrative” which allows him to also claim to be “a Bedouin, an Arab and a Jordanian” when interviewed by an Arab media outlet. Erekat’s casual relationship with facts is of course notorious: he was after all the man who played a big part in persuading the Western media – including the BBC – that a ‘massacre’ had taken place in Jenin in 2002. But there is much more to Erekat’s ‘Canaanite’ claims than just historical incompetence; the negation of Jewish history and the promotion of a supposedly equally relevant narrative is part and parcel of the PA’s policy and tactics – and one which should have been exposed to BBC audiences if the corporation is to meet its obligation to “[e]nable individuals to participate in the global debate on significant international issues”. The remainder of the interview will be discussed in part two of this post. In the absence of any clarification regarding “the morning’s unrest”, reasonable readers might well mistakenly conclude that the “clash” mentioned in the headline was brought about as a result of Palestinians being “denied entry to the site”. The opening lines of the report which appears underneath the photograph do little to dispel that mistaken impression. “Israeli police have clashed with Palestinian protesters on the Temple Mount in Jerusalem. In fact, readers have to continue right down to the eleventh and twelfth paragraphs (out of a total of sixteen) in order to understand the sequence of events. “When Israeli police arrived to open the Moughrabi, or Moors’, Gate just after 07:30 (05:30 GMT), they were attacked by the protesters, police spokesman Micky Rosenfeld said. From Ha’aretz we learn that, as is not uncommon, the rioters had spent the night on Temple Mount – presumably with the knowledge of the Waqf. “Some 50 protesters camped out overnight at the compound after rumors that ultra-Orthodox Jews planned to hoist the Israeli flag on the platform. In other words, the neutral-sounding “clash” – as it is presented by the BBC – was the result of a pre-planned attack by rioters on security personnel engaged in routine activity at the region’s most volatile site and the photograph and its caption actually relate to later incidents at a different location which are not covered in the report. Such pre-planned violence is unfortunately not rare (see, for example, reports of other recent incidents here and here) but it is only intermittently reported by the BBC. This isolated article does nothing to inform audiences of the organized nature of such events and the elements which lie behind that planning. “One of the most active groups on the Temple Mount in recent months is known as Al-Shabab Al-Aqsa. This group of young men is most often recruited by members of the northern branch of the Islamic Movement (lead by Sheikh Raed Salah) in order to “protect Al-Aqsa.” This means physically preventing Jews from attempting to pray on the Temple Mount or to cause damage to the site. These activists are Arabs from Israel and East Jerusalem who are paid for each “shift” that they work. Alongside them is the “Women’s Corps,” with the same assignment. These women are generally poor, divorced or widows and are recruited by the Islamic Movement, which pays their salaries and organizes their transportation to the mount. These provocateurs occasionally shout insults and “Allah Akhbar” at non-Muslim visitors, but usually just stand guard. “The unrest came as the Israeli parliament prepared to debate a motion calling on Israel to “realise its sovereignty over the Temple Mount”. The presentation of the latest in a long series of pre-planned violent incidents as though it were the spontaneous reaction of “protesters” to “rumours” of unknown origin, together with the omission of crucial background information regarding the parties behind the organization of this riot and others, is clearly not an adequate representation of the entire picture. The BBC cannot claim to meet its purpose to “[e]nable individuals to participate in the global debate on significant international issues” if it satisfies itself with telling only particular selected portions of a story. 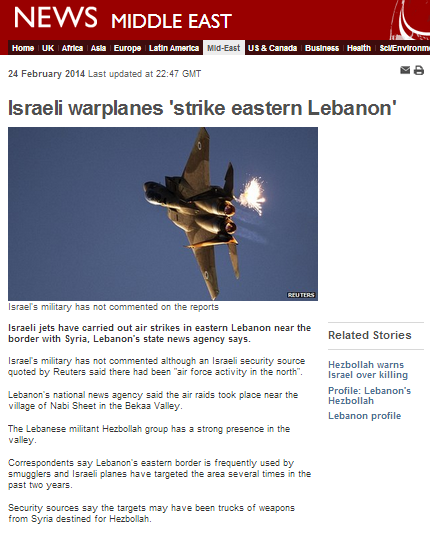 On February 24th a short report titled “Israeli warplanes ‘strike eastern Lebanon’” appeared on the Middle East page of the BBC News website. The report relates to allegations that the Israeli air-force attacked targets in the Bekaa Valley on that evening. As is intimated by the BBC’s use of cautious punctuation in its headline and as is stated in the body of the article, those reports – which originated from a Lebanese source – remain unconfirmed. “Israeli jets have carried out air strikes in eastern Lebanon near the border with Syria, Lebanon’s state news agency says. Israel’s military has not commented although an Israeli security source quoted by Reuters said there had been “air force activity in the north”. Hizballah’s television station ‘Al Manar’ initially denied the reports (with the terrorist organisation only changing its stance two days later), but that information is not communicated to readers of the BBC article. In the second half of the report the BBC ignores international designations of Hizballah as a terrorist organisation and downplays its paramilitary activities in the Bekaa Valley with coy euphemism. “Correspondents say Lebanon’s eastern border is frequently used by smugglers and Israeli planes have targeted the area several times in the past two years. Whilst it is certainly the case that various BBC correspondents have claimed in the past that Israel has targeted consignments of weapons en route from Syria to Hizballah in Lebanon, those correspondents actually have no verified factual evidence for their claims, not least because Israel has never officially confirmed the various allegations. Hence, this report’s transformation of conjecture based on hearsay and assumption into a categorical – rather than qualified – statement which is then communicated to BBC audiences as though it were fact, clearly breaches BBC editorial guidelines on accuracy. As has been the case with similar past articles, this short report focuses upon alleged Israeli activities, making no attempt to provide audiences with the necessary background information to enable them to place the reports of those actions in the correct context. Mention of the UN SC resolutions banning the arming of militias in Lebanon is omitted, as is any reference to Hizballah’s status as a heavily armed terrorist organisation supplied and supported by Iran. Clearly those important omissions are not conducive to the fulfilment of the BBC’s stated remit as an organisation which builds “a global understanding of international issues”. Over the years, quite a few mainstream media organisations have been taken in by various notoriously imaginative ‘scoops’ published by the American anti-Zionist blogger Richard Silverstein. 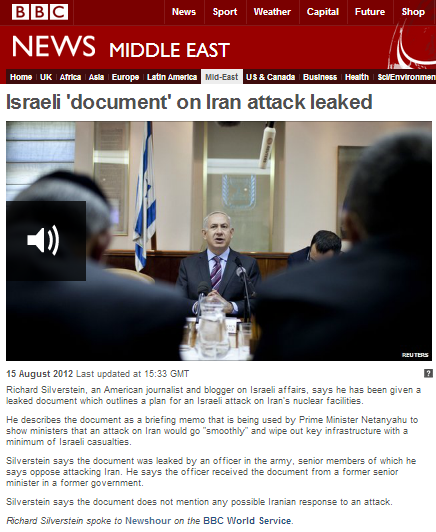 Readers may recall that in August 2012 (before the launch of BBC Watch), the BBC joined those dubious ranks by publishing two written items on its website based on Silverstein’s false claim to have acquired a “briefing document” which allegedly detailed Israel’s plans to attack Iran “sometime before November 6th ”, as he told the BBC in an additional audio interview with the World Service which is appended to both reports. One of the written reports was titled “Israel ‘prepared for 30-day war with Iran’” and the other was a piece going under the title “‘Leaked Israel memo’: propaganda or Iran war plan?” by BBC diplomatic/defence correspondent Jonathan Marcus. Both those items are still available on the internet – as is the audio interview – and the BBC responded to criticism at the time by bizarrely defending its decision to run stories based on a fictional document. Seven months later, in March 2013, we noted here another report by Jonathan Marcus on a subject which had also featured in a Silverstein article. Mr Marcus took umbrage and responded in our comments section. BBC source Richard Silverstein has recently been in the news yet again. For more on that saga – which will probably not come as much of a surprise to those familiar with the record of the “American journalist” as he was described by the BBC World Service – read our colleague Adam Levick’s reports over at CiF Watch – see (in chronological order) here, here and here. This latest row certainly reinforces the impression that insufficient critical thinking was employed by the BBC before the use, promotion and amplification of material from a source with a clear political agenda. The February 25th edition of the BBC Radio 4 ‘Today’ programme included an item presented by James Naughtie in which he spoke to Lyse Doucet about conditions in the Yarmouk camp area of Damascus. The programme is available for a limited period of time here and the relevant segment begins at around 02:34:20. As we noted here earlier this month, a similarly inaccurate claim was made in an article by Yolande Knell and Yousef Shomali about the same subject which appeared on the BBC News website. 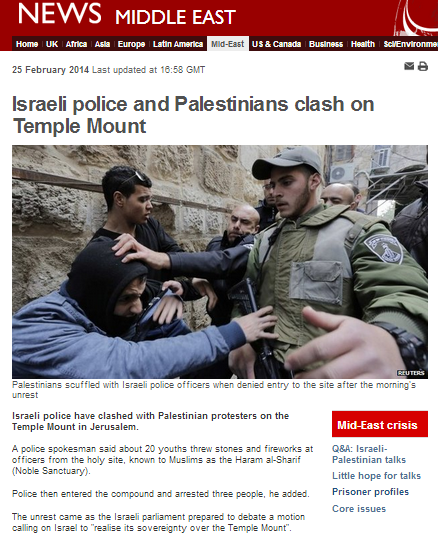 But two weeks on it seems that basic facts of Israeli history still evade other BBC reporters too. We look forward to an on-air correction by the Today programme, together with some equally urgently needed context for listeners regarding the political motivations which lie behind the fact that Syria and other countries have deliberately kept the refugees their attack upon the new Israeli state created – and generations of their descendants – in second-class refugee status for the last sixty-six years. A recent report which appeared in the BBC News website’s ‘London’ section provides an opportunity to take a closer look at the markedly different styles of reporting employed by the BBC when dealing with the issues of terrorism and the glorification of terrorism on its own home turf compared to its reporting of the same issues in the Middle East. Readers will no doubt recall that the BBC’s coverage of the release of convicted Palestinian terrorists last August included two filmed reports by Yolande Knell – here and here – from the lavish reception laid on by the Palestinian Authority at the time. In the party-like atmosphere of Knell’s reports, viewers were kept in the dark with regard to the crimes committed by the released convicts, who were described on multiple occasions as “heroes of the Palestinian cause”. Audiences were also encouraged to question the categorization of the released men as terrorists, with that terminology clearly signposted as an “Israeli view”. As readers are no doubt aware, the subject of the Palestinian Authority’s glorification of terrorism is not one which receives BBC coverage and so, unsurprisingly, neither Knell nor any other BBC journalists reporting on this event (or the similar later one) had any comment to make with regard to the fact that the PA organized reception focused on the glorification of the men and their terrorist acts. In contrast, the February 12th report appearing on the BBC website’s ‘London’ page – titled “Woolwich murder: Man pleads guilty to Rigby videos” – is factual in tone and includes ample use of various forms of the word ‘terrorism’, as do the three “related stories” (which, like Knell’s reports, date from August 2013) promoted by the BBC at the side of the report. The act of terrorism related to the charges against the man who is the focus of this article is clearly described. “Michael Adebolajo, 29, and Michael Adebowale, 22, will be sentenced later this month after they were found guilty of murdering Fusilier Rigby. Likewise, the man’s own actions are extensively detailed. Readers are at no point in this article or the related ones prompted to question definitions of terrorism or to regard them as a “view” held by one party or another. “Commander Richard Walton, head of the Counter Terrorism Command at the Met Police, said the murder had “shocked the nation”. And of course at no point are readers encouraged to entertain the idea that the accused man might be “a hero” of a particular “cause”. The cultural relativism which lies behind the different styles of reporting of these two stories is all too apparent and it of course leads to the adoption of double standards which clearly compromise the BBC’s reputation as an impartial provider of news. A quick perusal of the BBC News website shows that the corporation has had quite a lot to say about Israeli checkpoints for some length of time. “A recent report by a group of 20 aid agencies has drawn public attention to one of the little reported aspects of the continuing conflict between Israel and the Palestinians – checkpoints and roadblocks in the West Bank and Gaza. “Ahmed Kassem had hired this private taxi to pick him up on the north side of the Surda roadblock, which is on the north side of Ramallah, on his way home from a heart check-up in the town. He has to walk 10 minutes uphill in the midday heat to pass through the roadblock, and is very concerned about his health. He told BBC News Online he expected the journey – 20km in total – would take another three hours to complete. And when Israeli checkpoints feature in BBC content, they are more often than not presented without the context essential for audience understanding of their necessity – for example here and here. However, it turns out that some kinds of military checkpoints are reported very differently by the BBC. 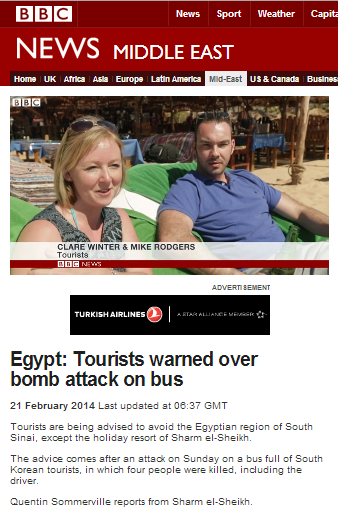 In a filmed report which appeared on February 21st on the BBC News website’s Middle East page, Quentin Sommerville informed audiences of the concerns of two British holiday-makers in the south Sinai with regard to the inefficiency of Egyptian checkpoints. Clearly the BBC can understand perfectly well the necessity for checkpoints when they are set up to safeguard British property or British tourists, but those set up to safeguard Israeli lives are apparently a different kettle of fish. 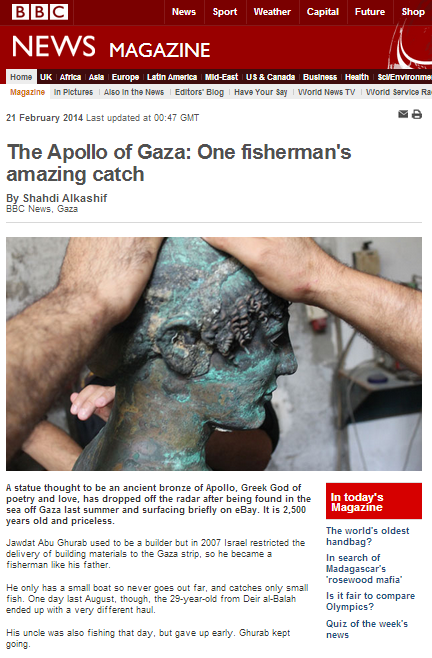 On February 21st an article titled “The Apollo of Gaza: One fisherman’s amazing catch” by BBC Arabic’s Shahdi Alkashif appeared in the ‘Features & Analysis’ section of the Middle East page of the BBC News website as well as in its ‘Magazine’ section. An audio version of the report appeared on the BBC World Service programme ‘The Fifth Floor‘ and is also available as a podcast for a limited period of time. Not only is no context provided to listeners as to why restrictions of movement to and from a territory ruled by a terrorist group are necessary, but clearly Alkashif’s claim that “the people cannot move out of Gaza” is highly inaccurate and misleading. In the week February 9th to 15th alone, 3,550 people used the Erez terminal to enter or exit the Gaza Strip. “A statue thought to be an ancient bronze of Apollo, Greek God of poetry and love, has dropped off the radar after being found in the sea off Gaza last summer and surfacing briefly on eBay. It is 2,500 years old and priceless. Uninformed readers are left with the mistaken impression that one day in 2007 Israel simply decided to restrict “the delivery of building materials to the Gaza Strip”. No mention is made by Alkashif of the all-important context of the violent coup which resulted in the Hamas take-over of the Gaza Strip and the subsequent escalation in missile fire at Israeli civilian targets which caused the designation of the Gaza Strip as ‘hostile territory’ by the Israeli government. Neither does Alkashif bother to inform readers what kind of building materials are restricted and to which projects and under what conditions they are permitted, or why it is necessary to control the entry of dual-purpose materials into a territory ruled by an internationally designated terrorist organization which uses concrete and other building supplies to construct cross-border tunnels for the purpose of carrying out terrorist attacks. Further on in the report Alkashif does state that “..the smugglers’ tunnels – dug to circumvent restrictions put in place by Israel and Egypt after the Islamist movement Hamas came to power in Gaza – have been out of action since they were closed by the Egyptian army last summer” but again insufficient background is given as to why such “restrictions” were necessary. And what of Jawdat Abu Ghurab’s employment history? Well, that seems to be rather flexible. At the end of January an article on the exact same subject appeared in Bloomberg Business Week. In that report it is stated that he has been a fisherman since 2005. “After four hours they succeeded in getting the object out of the water. It was the statue of a naked man. They loaded it on to a cart and took it to Ghurab’s house. Unlike Alkashif’s version of the story, other reports on the same subject – including that one from the Guardian, one in the Independent and one which appeared in the Jerusalem Post – have noted that experts are sceptical as to whether the statue was actually found in the sea. “It’s very, very rare to find a statue which is not in marble or in stone, but in metal,” he said, adding that the apparent pristine condition of the statue suggested it was uncovered on land and not in the sea, as claimed. “The one of Gaza is very special and unique because for us, it has not been, at all, found in the sea… It has been found, we don’t know exactly the place, we have a guess you know, in the north of Gaza….But it has been found surely, in the sand,” he said, adding that there were no tell-tale signs of metal disfigurement or barnacles that one normally sees on items plucked from water. “…the statue, with its green patina, was unlikely to have come from beneath the waves. Whatever the truth behind the discovery of the statue and whatever the reasons behind the timing of the story’s sudden extensive promotion in the international media some six months after its initial discovery, one thing is certain: Shahdi Alkashif’s context-free introduction of Israeli ‘restrictions’ on the entry of building materials to the Gaza Strip into the story and his claim that “people cannot move out of Gaza” are both misleading and gratuitous and can only be seen as being politically motivated insertions.